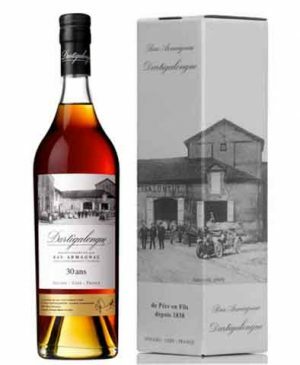 It was in 1838 during the reign of Louis Phillipe that Pascal Dartigalongue, originally from Saint Lannes near Madiran, moved to Nogaro in the Gers and founded his maison d’Armagnac which is alive and well today. He very quickly realised that Armagnac could be a successful export product. 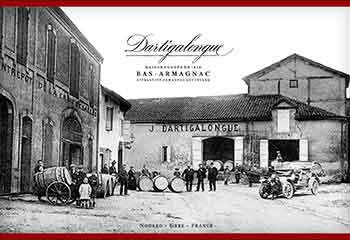 Despite many difficulties he managed to send oak casks of Armagnac to Bayonne where they would be shipped on to Holland and England.In 1870 he acquired the present vineyard, “lacroutz”, at Salles d’Armagnac. In about 1900 Joseph’s son Henri took over the family business. 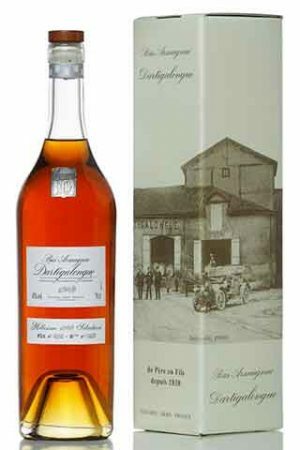 It was at this time that Eau de vie officially became Know as Armagnac and acquired the appellation ‘Jaune d’Or’. Thanks to the continuing expansion of the railways the trade in Armagnac also continued to grow.In 1930 Henri’s very young son Pierre took on the responsibility of visiting their clients, first in France and later abroad. This initiative increased sales dramatically. In 1936, at the end of prohibition, he went to the USA and did some very good business with the Americans. 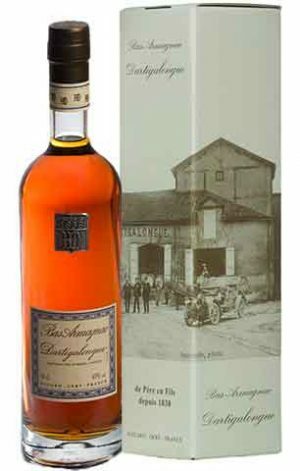 After the end of the second world war he developed the sale of Armagnac throughout Europe. 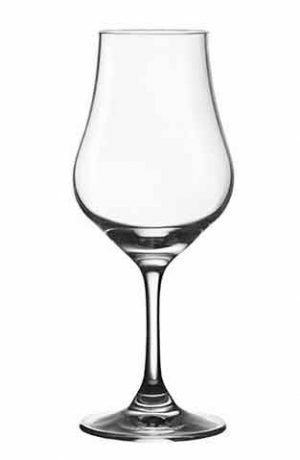 The Dartigalongue Armagnac Glass, produced by Lehmann Glass in France, is tulip shaped and is ideal for drinking Armagnac. Each glass is beautifully etched with the Dartigalongue logo. Capacity is 150 ml, 155 mm high, 63 mm wide, lead-free crystal glass. XO is a blend of several vintages aged from 10 to 20 years matured in oak barrels. 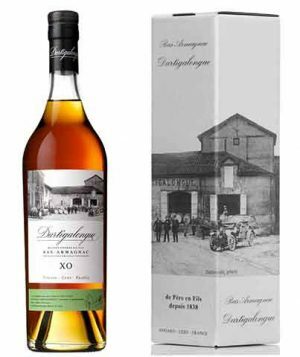 Dartigalongue XO Bas Armagnac, displays a complex nose of caramel, toasted almond, nougat and dried fruit. The medium-bodied, fruit-forward palate is accented by hints of tobacco, cedar and mineral which linger through the finish. A superb Vintage of the Dartigalongue 1982 harvest. Aged for 33 years in Oak barrels. *'Gold Medal' Catavinum World Spirits Competition 2013. Blend of several vintages aged more than 20 years in oak barrels (including 1992, 1990, 1987, 1988). 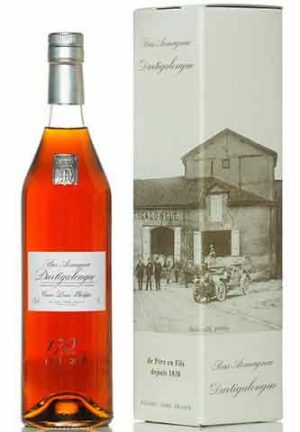 This Armagnac made with grape varieties Baco 22A and Ugni Blanc, was distillated once in a typical Armagnac continuous still, then was aged in gasconic oak barrels, in dry and then humid cellars. Beautifully presented in a Carafe. *500 ml Carafe in wooden frame. 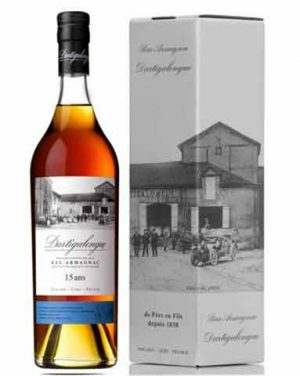 At 25 years or more matured in oak barrels, this Armagnac is exceptional. Beautiful amber, deep colour with bronze shades. Exceptional nose with aromas of spices, moka, vanilla and a hint of mango. On the palate, pure, elegant, neatwith a wide range of flavours like exocitic fruits, vanilla, dried fruits. Silky finish. "A gentle caress, a delicious and delicate moment with a crisp freshness and a long finish. "A for the price, A for presentation, A for the taste. So complex and fruity, so enjoyable. A definite ''wow'' factor here"
"Mouth: strong arrival, tons of fruits, more cherries, thick fruit cake, wild red fruits, dark berries, so complex and fruity"
Blend of several vintages aged from more than 30 years in oak barrels. Armagnac toned and shimmering deep amber. The palate is fresh , round and balanced. The flavors are deep and melted. Prunes and spices. The long finish in the mouth is powerful with aromas. A superb Vintage of the Dartigalongue 1997 harvest. Aged for 20 years in Oak barrels and bottled at the higher 47% abv. Bottled in 2018, 488 bottles released. 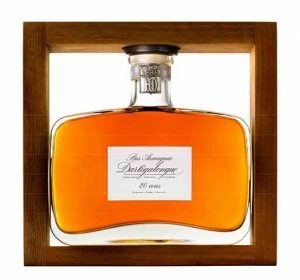 A special blend of Armagnac over 35 years old created to celebrate the 170th anniversary of the house. Blending Bas-Armagnac from 1974 & 1976 Vintages (70%-30%), the grapes used are Folle Blanche, Ugni Blanc and Baco. "its intense amber color unveils a candied fruits flavor, with delicacy, followed by an enchanting foretaste of white flowers, candied fruits (black fig) and crushed almonds for a lasting velvet finale" "The nose is silky and soft, with still full of fruit: plums, oranges, raisins and wild cherry. Yum. We also discover a delicate touch of spice. The mouthfeel is equally intoxicating, dark and dense. Always silky and fruity. Wood is really discreet, serving the fruit rather than overwhelming. There are also some rose petals. "The final is silky and fruity, with an indescribable red flowers. Quite long too"
A superb Vintage of the Dartigalongue 1970 harvest. Aged for 47 years in Oak barrels, bottled in 2018. 'Gold' Best French Spirits, Hong-Kong 2014. A superb Vintage of the Dartigalongue 1984 harvest. 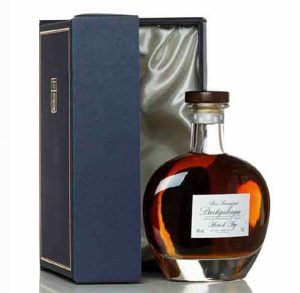 Aged for 33 years in Oak barrels and bottled at the higher 45% abv. Bottled in 2018, 476 bottles released. A superb Vintage of the Dartigalongue 1979 harvest. Aged for 35 years in Oak barrels. 'Gold Medal' Catavinum World Spirits Competition 2013.